Long non-coding RNAs (lncRNAs) are transcripts of longer than 200 bp that lack coding potential. They serve as versatile regulators of plant growth and development as well as biotic/abiotic stress response. In flowering plants, seed development is a key and carefully-regulated process subject to both genetic and epigenetic control, but lncRNAs have not yet been thoroughly interrogated in seeds, especially in the persistent endosperm of the dicotyledons. The potential functions and inheritance patterns of lncRNAs, as well as the epigenetic regulation of lncRNA itself, remain largely uncharacterized in plant seeds. The seed of castor bean (Ricinus communis, Euphorbiaceae) has a relatively large and persistent endosperm, unlike other dicotyledons such as Arabidopsis that have an extremely small and transient endosperm. Thus, castor bean is used as a model plant for studying endosperm and seed development in dicotyledons. Prof. LIU Aizhong and his colleagues at Kunming Institute of Botany, Chinese Academy of Sciences (KIB/CAS) comprehensively identified and characterized 5,356 lncRNAs in castor bean seeds. 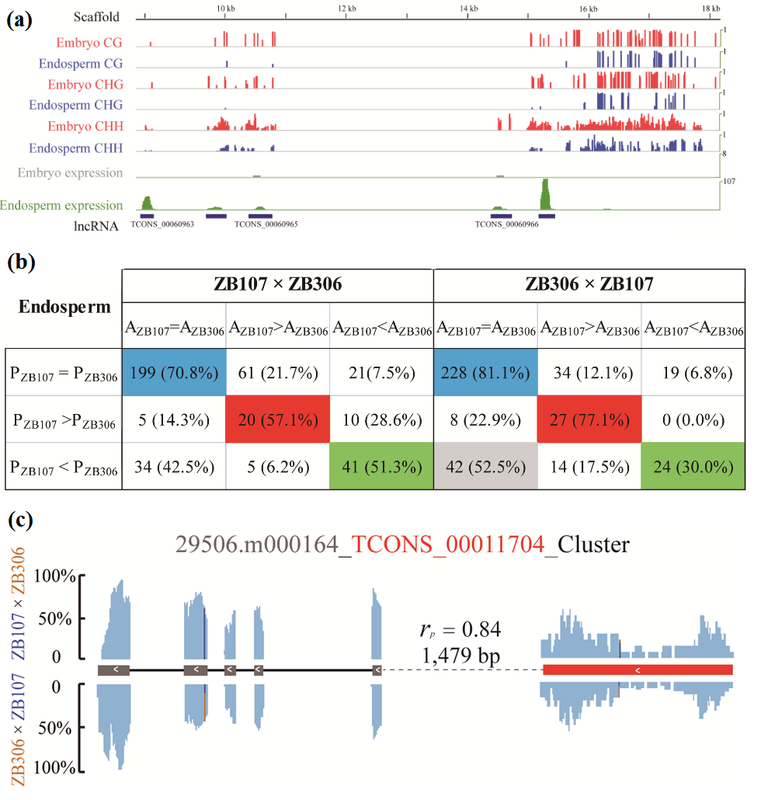 Base on genome-wide analyses they found that a small fraction of lncRNAs exhibited coordinated expression with nearby PCgenes. Further co-expression network analysis with WGCNA revealed the potential functions of lncRNAs during the castor bean seed development. Genomic DNA methylation analyses revealed that the expression level of lncRNAs was tightly linked to DNA methylation and that endosperm genome hypomethylation can significantly promote the expression of lncRNAs. Intriguingly, upon hybridization, most lncRNAs with divergent genome sequences between two parents could be reconciled and were expressed according to their parental genome contribution; however, some deviation in the expression of allelic lncRNAs was observed and found to be partially dependent on parental effects. In triploid endosperm, the expression of most lncRNAs was not dosage sensitive, as only 20 lncRNAs had balanced dosage. The research findings revealed that lncRNAs play potential roles in regulating the development of castor bean endosperm and embryo, and provided novel insights into the parental effects, allelic expression and epigenetic regulation of lncRNAs in dicotyledonous seeds. This study entitled Differential expression networks and inheritance patterns of long non‐coding RNAs in castor bean seeds was published in The Plant Journal. Authors are grateful for the financial support from the Chinese National Key Technology R&DProgram (grant no. 2015BAD15B02), National Natural Science Foundation of China (31661143002, 31771839 and 31701123) and Yunnan Applied Basic Research Projects (2016FB060).